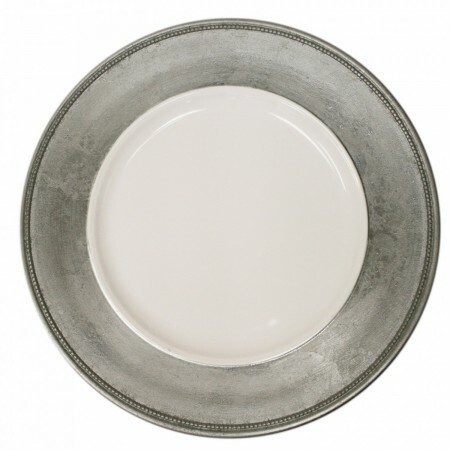 The Jay Companies A466HRK-W Round Silver Leaf Rim Charger Plate 13"
TigerChef > Tabletop > Tabletop Accessories >< Charger Plates > The Jay Companies A466HRK-W Round Silver Leaf Rim Charger Plate 13"
$269.99 10 Strawberry Street VINE-24SL Vine Silver Line Charger Plate 13"
Glamorous and elegant, the Jay Companies A466HRK-W Round Silver Leaf Rim Charger Plate 13" is an excellent way to enhance your dinner service style. Featuring a beautiful silver gold leaf design on a white background, this charger is suitable for high end restaurants and formal event catering. With a spacious 13" diameter, it can comfortably hold any dinnerware piece from soup bowls to dinner plates to create a formal ambiance that will impress your guests. Crafted of melamine it is lightweight, break-resistant and durable and is easy to wash and recuse for long-lasting service.